MAXIMA is an intensive six week REU program in interdisciplinary mathematics, funded by a 3-year NSF REU grant and by the IMA. Students will work in teams of four on an open research problem in applied mathematics. Each team will be advised by a Macalester Mathematics, Statistics, and Computer Science (MSCS) faculty member. In Summer 2012, problems will be posed by University of Minnesota (UMN) researchers from computer science and electrical engineering. Students will also be mentored by a postdoctoral fellow at the IMA. The program is designed to allow students to experience the excitement of doing research that is relevant to another field. Students will learn how to formulate domain-specific questions in mathematical ways and assimilate the ability to communicate across disciplines. The program will develop mathematical skills and expository argumentation. By the end of the summer, each team will produce a written report, an oral presentation, and a research poster. Students must be current sophomores and juniors who will be full-time undergraduate students as of September 2012, majoring in mathematics or a related field at a U.S. college or university. Students must have taken multivariable calculus, linear algebra, and at least one upper-level undergraduate courses (and preferably more). Exposure to one of computer science or statistics is also preferred. See the problem descriptions for further background requirements. Students must be fully committed to the REU. Students may not engage in any other course work or employment for the duration of the program. Nine spots are funded by the NSF: these are open to US citizens and permanent residents. Three spots are funded by the IMA: these spots are open to US citizens and permanent residents, and to international students studying at US institutions. Women and underrepresented groups are particularly encouraged to apply. 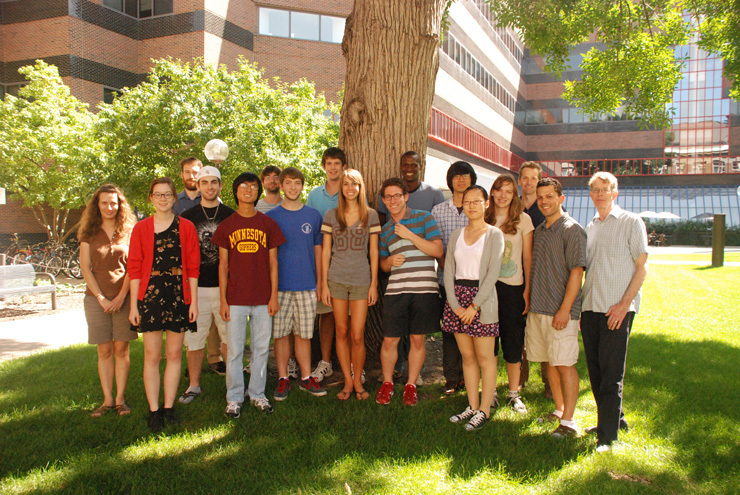 Students receive a stipend of about ,300 and a travel allowance to/from the REU site. UMN campus housing and meals are provided at no additional cost. Support will also be provided to attend a national mathematics meeting to present the student research. Pursuit-evasion games are models for controlling autonomous teams of robots. In a pursuit-evasion game, one or more pursuers try to capture an evader who in turn tries to avoid capture. There are many variants of pursuit-evasion games based on the environment (e.g., a polygon, graph), information available to the players (e.g., can they see each other at all times? ), motion constraints (e.g., a car chasing an evader cannot turn arbitrarily), and the definition of capture (e.g., confinement, threshold distance, line of sight). The lion and man game is a geometric pursuit game. In the original version, the game takes place inside a circular arena. The players have the same maximum speed. The objective of the lions (pursuers) is to capture the man (evader) by moving onto the man's current location. The team will study this game played in a polygonal environment, a typical setting for robotics applications. In the turn-based version, one lion can always catch the man in a simply connected polygonal region. Recently Isler and Bhadauria showed that three lions can always catch a man in a polygonal region with polygonal holes. The research team will characterize the polygonal environments with holes where two lions suffice. The team will also investigate the effect of more practical models of robot movement, taking into account robot turning speed. Required background: discrete mathematics, combinatorics. Useful background: computational geometry. The ability to scale a laser to high power is generally limited by one or more physical effects. For example, single-spatial-mode semiconductor lasers are limited by catastrophic facet damage to approximately 1 watt. Fiber lasers, on the other hand, can produce powers at the kilo-watt level before they are limited by nonlinear effects, such as stimulated Brillouin scattering. To achieve higher powers within a single spatial mode, it is possible to generate smaller amounts of power in separate modules and combine these powers in a separate optical system. This generally involves coupling many lasers together to form a coupled oscillator. Laser systems are inherently nonlinear; this system of coupled oscillators gives rise to complex dynamics. Indeed, self-pulsation, stable regions, and chaos have all been observed. The research team will develop a mathematical model to explain the system dynamics observed in two custom-made fiber lasers operating at high power (100 watts). This model will be used to determine the optimal performance of this approach to high-power laser operation. Required background: differential equations, linear algebra, and an interest in physics. Useful background: waves and optics. Member contributions power online communities. Users edit Wikipedia pages, upload videos to YouTube, and tweet on Twitter. Our work and play depend on the health of these online communities, but they may not be perfectly fit. For example, the number of active Wikipedia editors is declining, and these editors must deal with an increasing amount of vandalism on articles. This project seeks to 1) develop mathematical metrics that capture the health of an online community and 2) apply those metrics to identify specific behaviors that hurt and harm a community. Students in this REU will analyze huge data sets representing online behavior in communities, such as Twitter and Wikipedia. They will develop hypotheses about effective behaviors for a community (i.e., that users follow a diverse set of other users) and analyze user-level data to determine whether those behaviors do, in fact, lead to positive outcomes. Students will draw together these findings to develop health metrics that quantify the overall value of a community and study the implications of these metrics. Required background: data structures, algorithms, and/or statistical analysis. Useful background: experience with Python, parallel computing, social psychology, and graph theory.